Music is a fine art that crosses all boundaries of language, religion, caste and culture and touches the very soul of those listening to it. Featured in this poster is a beautiful picture of mother and daughter immersed in music. The mother teaches the daughter how to hold the guitar and strum it. She places her lovely daughter on her lap, teaches her how to hold the instrument and then tunes it for it. 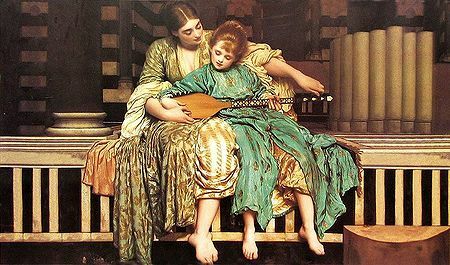 Both the mother and daughter seem to be completely immersed in their musical session, the daughter listening to her and watching her every move attentively. Both of them are alone on their little planet music and seem to be blissfully unaware of everything else going on around. The daughter delicately places her left hand on the finger board and tries out some harmonic notes, while the mother carefully fine tunes the instrument, so that the scales can be played clearly.